It has been said that no sooner are we born, we begin to die. Still, our perspective can just as easily be that no sooner are we born, we begin to live. As a student of life, you may discover that there are sadly far too many of us who never really live, but rather simply exist. We squander our youth foolishly only to find ourselves in the autumn of our lives filled with sadness and regret. Some o… f us become old and tired long before our body ages, left to face the finality of our lifetime in solitude and despair. Oh to be young again and know then, what we know now! What would we have done differently, and what might we have shared with others who may have never truly come to know us? But what determines how much time is left to live life to the fullest? When is it ever too late? Life can change in an instant, and that moment is now. Begin your journey today and discover how one thought, one choice, one specific moment can make one day of life worth more than a lifetime of simply being. Challenge yourself with every turning page to experience the ultimate transformation of your spirit. Allow the student of life within you to evolve into a genuine master of living. Accept your purpose and find absolute fulfillment in the knowledge that if you are here, it is because you are meant to be. 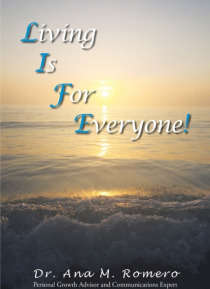 Rejoice in knowing that Living Is For Everyone!